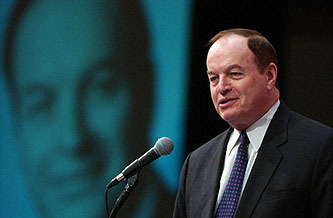 Sen. Richard Shelby (R-AL) has put an extraordinary “blanket hold” on at least 70 nominations President Obama has sent to the Senate, according to multiple reports this evening. The hold means no nominations can move forward unless Senate Democrats can secure a 60-member cloture vote to break it, or until Shelby lifts the hold. ….According to the report, Shelby is holding Obama’s nominees hostage until a pair of lucrative programs that would send billions in taxpayer dollars to his home state get back on track. The two programs Shelby wants to move forward or else. The senator who is shepherding the Obama administration’s package of Wall Street reforms through Congress said on Friday morning that talks with his Republican counterpart had broken down. The senator, Christopher J. Dodd, indicated that Democrats would forge ahead with their own bill, after months of talks that had been aimed at reaching a bipartisan consensus. I am shocked, I tell you, shocked. A leading member of the party that’s the scourge of earmarks is blocking all nominees for everything1 unless his earmarks are hustled back onto the fast track, and months of negotiations with the party that insists it’s willing to negotiate with Democrats in good faith have broken down because, in fact, they aren’t. They aren’t, as most of us with three-digit IQs already knew, willing to agree to any financial regulation that has even the slightest chance of actually regulating the behavior that caused the 2008 meltdown. But I’ll take my good news where can I get it. And here it is: I got home late enough that I really don’t have much time to blog this latest bout of GOP hypocrisy and kowtowing. So I won’t. Catblogging is coming up next! 1No, that’s not a typo. All nominees. For everything.